The hull of the first of the Royal Australian Navy’s two new amphibious ships has been launched in Spain, heralding a new era for Australia’s amphibious capability. Chief of Navy Vice Admiral Russ Crane led the launch and said the event was enormously significant. “These ships are officially known as Landing Helicopter Docks or LHDs and are the largest the Australian Navy has ever owned,” Vice Admiral Crane said. LHD01's hull launch was held at the Navantia dockyards at Ferrol in northern Spain with the event having a distinctly Australian feel, as children of Australian diplomats in Spain joined the official delegation, waving Australian flags. A Canberra regional sparkling wine was broken over the Canberra Class ship’s hull. Vicki Coates, wife of the late Rear Admiral Nigel Coates, who commanded the previous HMAS Canberra, was the ‘launch lady’. Vice Admiral Crane said that with a new generation in technology would come a new way of thinking in terms of how Navy would operate and crew this new capability. Both ships will be based at Garden Island in Sydney. Crewed by all three services, the LHD will mark a significant strengthening of the ADF’s amphibious capability and tri-service culture. The “Canberra” received its first seawater christening in Ferrol, in the presence of the chief of the Royal Australian Navy, Vice Adm. Russell Crane. 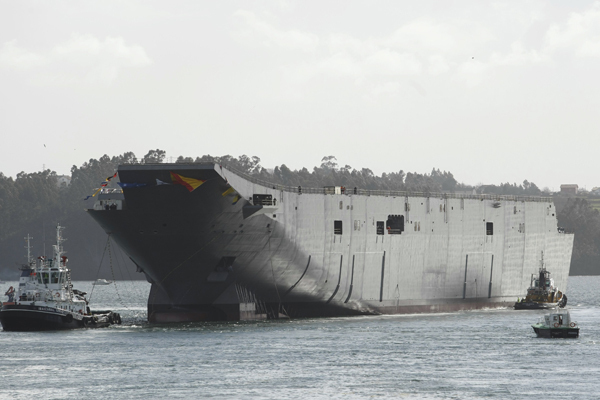 Today at 15:46 hours, at its facility in Ferrol, Navantia launched the first of two amphibious ships for the Royal Australian Navy. Attending were Mrs. Vickie Coates, the ship’s godmother, the commander of the Royal Australian Navy, Vice Adm. Russell Crane, and representatives of the Commonwealth of Australia, BAE Systems and Navantia, including its new managing director, Luis Cacho Quesada. Construction of this ship, which was launched two months earlier than scheduled, began with the first metal cut on Sept. 23, 2008, followed by laying of its keel 12 months later, on Sept. 23, 2009. This early launch will provide additional time for its fitting out and its sea trials, in the summer of 2012, after which the hull will be transported to Australia for completion and handover by BAE Systems Australia in Williamstown. The contract for these two amphibious ships was awarded on Nov. 23, 2007 in Melbourne; they will be handed over to the customer in 2014 and 2015. 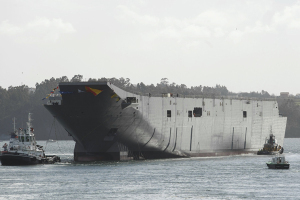 FERROL Spain --- The hull of what will be Australia’s largest warship — the Canberra Class Landing Helicopter Dock (LHD) Ship 1 — was today launched at Ferrol Dockyard, Spain. The hull was built up to the flight deck by Navantia under contract to BAE Systems Australia, which is constructing the superstructure at the Williamstown facility and will consolidate the ship and integrate the combat system. The hull will arrive at BAE Systems Williamstown Dockyard in August 2012 after a 23,150-kilometre journey as a ‘passenger’ on the world’s largest open-deck semi-submersible heavy lift ship, the Blue Marlin. The hull launch marks another important milestone in the construction of Landing Helicopter Dock ships HMAS Canberra and HMAS Adelaide. The ceremony was attended by the RAN Chief of Navy Vice-Admiral Russ Crane, Agent-General for Victoria Sally Capp and other Australian and Spanish dignitaries. Vice-Admiral Crane will also attend the keel laying of the second LHD on 18 February where, in keeping with tradition, he will place a gold coin on the centreline dock block. Victorian Minister for Manufacturing, Exports and Trade Richard Dalla-Riva paid tribute to BAE Systems Australia: ““I congratulate Melbourne’s BAE Systems as the prime contractor for this project to build the largest ever warships for the Royal Australian Navy. The major task of installing the superstructure which houses the critical ship control and combat systems will take place here, right on Melbourne’s doorstep at Williamstown. Both vessels will be welcomed additions to Melbourne’s skyline. “This project is a terrific endorsement of Victoria’s shipbuilding capacity and it positions Williamstown to compete for future naval shipbuilding work. “To help this happen, the Baillieu Government is working with the Federal Government now to ensure Williamstown secures its fair share of the projected $40 billion spend on new naval ships” he said. BAE Systems Australia is contracted to deliver two, 27,000 tonne Canberra Class LHD ships between 2014 and 2015 under JP2048 Phase 4A/4B. The company is managing the total project in close cooperation with our customer, the Defence Materiel Office and subcontractors Navantia, Saab and L-3 Communications. Maritime Business Unit Director Harry Bradford said: “In scale and complexity this is the most challenging Prime Systems Integration task ever undertaken for the ADF in Australia. “Steel cutting and block manufacture for the superstructure and combat system integration for the ship has already begun at Williamstown. “We are working closely with the Commonwealth and our sub-contractors to ensure that this critical project remains on track both here and in Spain,” Mr Bradford said.